Maya Stovall: Liquor Store Theatre, vol. 4, no. 7 (2017). Courtesy the artist and Todd Stovall. Pictured performers include Seycon-Nadia Chea and Mohamed Soumah with the artist. Liquor Store Theatre, vol. 3, no. 4 (2016). Courtesy the artist and Todd Stovall. Pictured performers include Biba Bell and Mohamed Soumah along with the artist. Cranbrook Art Museum presents Liquor Store Theatre Performance Films by Detroit-based artist Maya Stovall, an innovator who works across the disciplines of dance, theory, anthropology, ethnography, and contemporary art. The museum will feature films from this series of site-specific dance interventions that began in 2014, as well as premiere a new film created in summer 2017 for the exhibition. 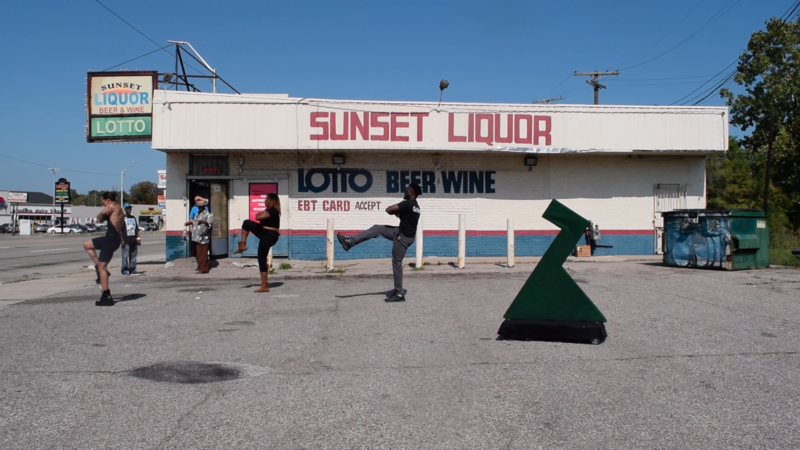 In Liquor Store Theatre, Stovall situates her stage in the public parking lots, sidewalks, and streets in front of liquor stores in her McDougall-Hunt neighborhood in Detroit. In an area with few operating storefronts, the liquor stores have become the de-facto centers of commerce, including groceries and electronics, and a place for residents to socialize. The unannounced performances include herself and several dancers that perform a meditative-style of ballet and jazz with the occasional bystander joining in the movement. Beyond the dancer’s bodies, the performance ruptures the stilted choreography of daily life for the people in the neighborhood—a moment of curiosity and spectacle just for them. After each performance, Stovall engages her audience in conversation and documents their personal experiences, musings, and predictions on Detroit’s socioeconomic condition and future. Dance is not the objective, but a conduit for communication and reflection. Maya Stovall: Liquor Store Theatre Performance Films is presented at Cranbrook Art Museum contemporaneously alongside three other solo exhibitions by artists that all operate at the intersection of art and street culture: Ryan McGinness: Studio Views; Basquiat Before Basquiat: East 12th Street, 1979-1980 (traveling from MCA Denver); and Keith Haring: The End of the Line. Like early interventionist graffiti by Basquiat and Haring before her, Stovall works against the surface of the street and her movements are a form of ephemeral markmaking. Public space is reimagined by these artists as canvas, stage, and site for collaboration with everyday life.Maya Stovall is a fourth generation Detroiter and currently a Ph.D. candidate in Cultural Anthropology and Performance Studies at Wayne State University. Works from the series were recently presented as part of the 2017 Whitney Biennial.